What's an Android user worth? Excluding Motorola, Google’s gross margins have dropped for six out of the last nine quarters. They peaked at 65.8% in early 2011 but have now dropped to 60.4%. 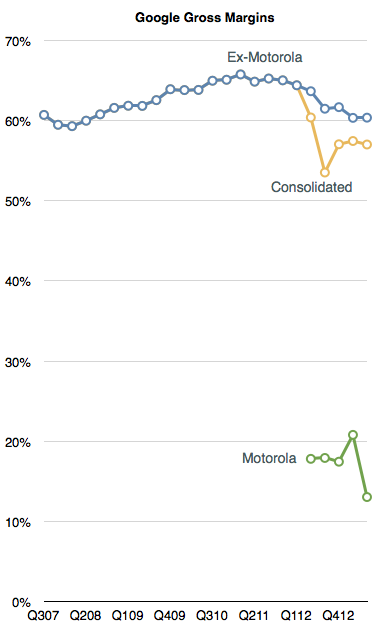 Including the drag from Motorola they are down to 57%. Gross margins include the effect of price, volume and direct costs of sales. Although sales have grown (see graph below), the pricing Google has been able to obtain (CPC) has fallen. The cause is unknown but there is a strong correlation between the growth in their mobile channel. For their part, management cites mobile as having an effect in reducing CPC though they caution that it’s one of many factors. The elephant in the room is indeed the effect of 900 million activated Android devices (with 1.5 million added each day.) These nominal billion devices are a new channel that could be said to have doubled Google’s addressable market in only the last three years. The effect of this doubling is perhaps partly underlying the top line growth shown above. I placed Google’s performance alongside Microsoft’s for a reason. Since Microsoft has had precisely zero benefit from any new mobile channels, and since its software is broadly tied to business spending (as is Google’s), we can consider Microsoft as a control in what baseline non-mobile growth could be. 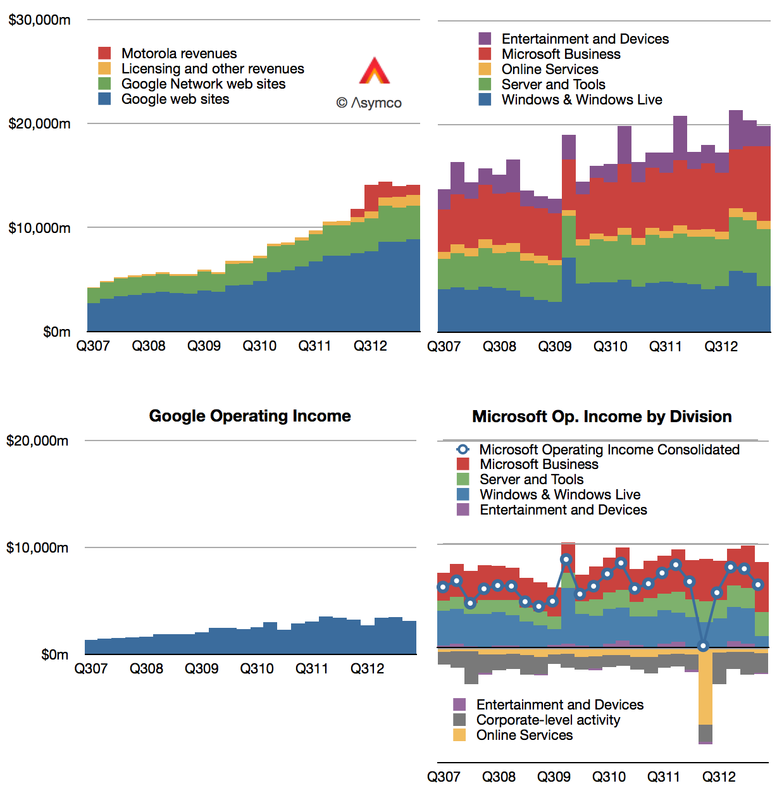 From Q2 2010 to the present (the Android epoch), Microsoft’s consolidated revenues grew by 24% (31% if we exclude Windows). In contrast, Google’s advertising revenues (excluding Motorola and licensing) have increased by a more robust 83%. So it’s possible that mobile contributed to top line growth. The effect could be 50% over three years. The downside is of course that this comes from a doubling of the channel. The new channel is therefore half as engaging. In terms for bottom line, the effect would be seen as more subdued growth. Overall, income increased 32% for a nominal doubling of usage. Expansion of user base usually comes with lower engagement and margins. I demonstrated the same effect with the vast expansion of iTunes customers. The only difference seems to be that markets reward Google’s margin dilution but punish Apple’s. Put another way, hypothetically, as she spends slightly less, the market value for an Apple user is disappearing while as he spends a lot less, the value placed on a Google user is increasing.